Can a smart home save your life? Where smart smoke detectors have an edge is their ability to send a notification to your phone when the alarm is triggered — even if you are away from home. Smart smoke detectors (like those that are part of the Nest product line) also notify you when the battery gets low or if there is a problem with the sensors in the unit. These two capabilities alone have the ability to save the lives of you and your family. If there is one smart device for your home worth investing in, it is a smart smoke detector. 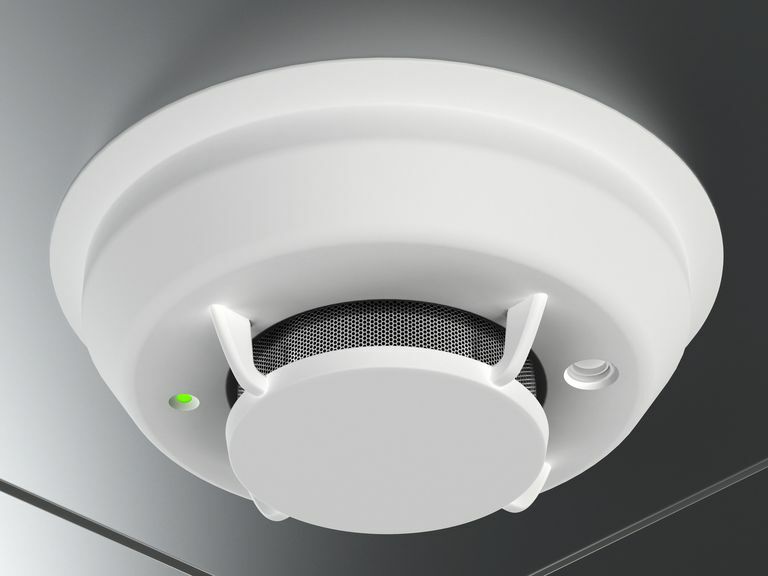 While the types of sensors used (ionized or photoelectric sensors) are the same for both traditional and smart smoke detectors, that's where the similarities end. Smart smoke detectors incorporate self-testing features to monitor battery power and proper sensor function and send a notification to your phone if there is a problem. Most models of smart smoke detectors also incorporate carbon monoxide detection into their features as well. If your smart smoke detectors integrate with your home automation system, your connected home can use the capabilities of the smart smoke detectors along with sensors from other devices that detect heat and light to alert you faster should a fire occur. The easiest way to understand how smart smoke detectors work is to think of them as Wi-Fi smoke detectors. When an alarm is triggered, the smart smoke detectors use Wi-Fi or similar communication technology to connect to your smart home hub (if you have one) and an app on your smartphone. If you just accidentally burned a batch of peanut butter cookies while watching the Broncos game and it's a simple false alarm, you can use the phone app to silence the alarm. If you have multiple smart smoke detectors synced up, all of them will sound alarms even if only one is triggered. Additionally, the notification you receive on your phone or communications from your smart home hub can help you determine which alarm has been triggered to help you find the problem. If you are away from home and receive a notification that is concerning, you can notify emergency services quickly and potentially avoid serious property damage. Smart smoke detectors have work-arounds for when the power or internet is out. Even if your smart smoke detector is hard-wired into your electrical system, the battery back-up system will take over during a power outage. If there is an internet outage, several smart smoke detector models can also use Bluetooth to communicate with your cell phone (if you are home) or with your smart home system when an alarm is triggered. As long as your smart home hub or system has cellular connection capabilities, it can use a standard cellular signal to send notifications to you and emergency services when an alarm is triggered. However, not all smart home automation systems feature cellular connectivity and some options may require an additional device and possibly a monthly fee for this cellular connection. If internet or power outages are common in your area, choosing an option that offers cellular connectivity provides peace of mind that may be worth the extra cost. What Are Listeners and How Do They Work? If you have a fairly large home or have several smoke detectors to replace, you may want to invest in a listener for areas of your home that will still have traditional smoke detectors for some time. Listeners are devices that plug into a standard wall outlet (and include a battery back-up) that literally "listen" for your smoke detector alarm. If your smoke detector alarm sounds, the listener device sends a notification to an app on your phone. The drawback to using a listener is that because it doesn't actually communicate with the smoke detector itself, you can't silence false alarms with it and you also miss out on the carbon monoxide detection and self-monitoring of battery life and sensor function features of a smart smoke detector. However, if you have to replace your smoke detectors over time instead of all at once, a listener is a viable option to keep you updated should a traditional smoke alarm in your home go off. What Are Smart Batteries and How Do They Work? Smart batteries are made to work with traditional smoke detectors and fit inside the standard battery case. The difference with smart batteries is they include the capability to send you a notification if the alarm is triggered or if the battery power is low. While smart batteries are the least expensive option if you just want to receive a notification should the alarm go off when you are away from home, they lack the ability to self-test and monitor sensor function or to communicate with other smoke detectors in your home. Smart smoke detectors are available at many home improvement stores such as Lowe's or Home Depot, consumer electronics stores such as Best Buy, and through online retailers such as Amazon. Even some household goods stores carry smart smoke detectors, such as Bed, Bath & Beyond. Installation of smart smoke detectors depends on whether they are battery-powered or hard-wired. Battery-powered smart smoke detectors are the easiest to install as you can mount them on any wall (or ceiling) the same way you would any other item such as a painting or decorative shelf. If you are installing more than one, it's best to insert the batteries in all of them and perform testing and pairing first before mounting them on the wall (for testing and pairing, the devices will come with step-by-step instructions for you to follow). Hard-wired smart smoke detectors require you to turn off the power to your home at the breaker box while you remove your old hard-wired traditional smoke detectors and follow the instructions to connect your smart detectors. If you are unsure of anything when installing hard-wired smart smoke detectors, it's best to request assistance or hire someone with electrical know-how to ensure correct installation. Fire safety experts recommend replacement of any type of smoke detector at least every 10 years. Many homes have smoke detectors far older than 10 years, which increases the risk of sensor malfunction or failure. If your smoke detectors need to be replaced anyway, the additional safety features of smart smoke detectors over traditional smoke detectors are well worth the price difference. If you already have a smart home system, adding smart smoke detectors that integrate with your existing system gives you added functionality you would never get with traditional smoke detectors. When part of a connected home, you can set your system to flash lights (or change colors for colored smart light bulbs), and you can even shut down your HVAC system from your phone during a fire or carbon monoxide event--a feature that fire safety experts agree can give you and your family more precious time to get out safely. Updated building codes set to go into effect within the next decade in several areas around the United States require homes with multiple smoke detectors to be synced or connected, whether through wiring or through smart home technology so that when one alarm is triggered, all of the alarms in the home will sound. Choosing smart smoke detectors now puts you ahead of the curve.